A war is brewing on Capitol Hill. And while wars tend to create refugees, this one may result in fewer of them. Sen. Mark Kirk (R-IL) is trying to get a handle on the real number of Palestinian refugees in the Middle East — a move that could result in a change of status for millions of Palestinians. His proposed language for the 2013 foreign appropriations bill would require the U.S. government to confirm just how many Palestinians currently served by the U.N. Relief and Works Agency (UNRWA) — the body taskedwith providing assistance, protection, and advocacy for Palestinian refugees — are actually refugees. The bill, slated for markup on May 22, would challenge the status of the children, grandchildren, and great-grandchildren of Palestinian refugees — a great many of whom claim to be refugees despite the fact that they were never personally displaced in the 1948 and 1967 Arab-Israeli wars. The knock on UNRWA is that it exists to perpetuate the refugee problem, not solve it. It was UNRWA that bestowed refugee status upon “descendants of refugees,” regardless of how much time had elapsed. As a result, the Palestinian refugee population has grown seven-fold since the start of the Arab-Israeli conflict. As one study projects, if descendants maintain their current status, the number of “refugees” in 2020 will be 6.4 million — despite the fact that few of the actual, displaced Palestinians will still be alive. In 2050, that number will reach 14.7 million. UNRWA’s warts notwithstanding, American taxpayers have rewarded it year after year. In the 2011 fiscal year, U.S. assistance to UNRWA stood at $249.4 million. Total contributions since its founding in 1949 amount to a staggering $4.4 billion. In recent years, politicians and policy wonks, including one former UNRWA administrator, have called for UNRWA reform. The agency hasn’t merely demurred; it has girded for battle. UNRWA set up shop in Washington with two Hill-savvy professionals, despite the fact that its operations are entirely based in the Middle East, anticipating the need for what looks a full-scale lobby effort to defend its mission. The agency even toyed with changing its name last year in an attempt to burnish its image in the West. UNRWA’s time to defend itself has unquestionably arrived. The Kirk amendment would require the secretary of state to report to Congress on how many Palestinians serviced by UNRWA are true refugees from wars past — those who could prove that they were personally displaced. That number is believed to be closer to 30,000 people. This new tally would then become the focus of America’s assistance to UNRWA for refugee issues. Despite congressional Republicans’ current fervor to rein in America’s out-of-control debt, the bill’s proponents do not call for a full cutoff to the descendants. Rather, they seek to ensure that UNRWA services keep flowing to those who are needy. The United States would simply not view them as refugees — just people living in the West Bank or Gaza and below the poverty line. But funding for the future would not be guaranteed. As Kirk’s office explains, Congress will soon need to consider tough questions, like whether U.S. taxpayers should be footing the bill for welfare programs in the West Bank and Gaza, or whether such services should be provided by the Palestinian Authority. The fact that this language has made it to mark-up is nothing short of remarkable. The Israelis have historically avoided locking horns with UNRWA at all costs. In fact, they have quietly lobbied against UNRWA reform in the past. As one Israeli official confided, the Israel Defense Forces don’t want to risk being saddled with providing services to the refugees in the West Bank and Gaza should UNRWA unravel. Indeed, one of the Israelis’ primary purposes in signing the Oslo Accords and supporting the creation of the Palestinian Authority was to ensure that they were no longer saddled with the responsibility of providing services to the Palestinians in the West Bank and Gaza. But today, with the peace process moribund, if not dead, the Israelis believe that UNRWA reform could serve as a defibrillator of sorts. By tackling one of the toughest challenges of the Palestinian-Israeli conflict without the bedlam that typically accompanies bilateral negotiations, there would theoretically be one less sticking point when the stars align again for diplomacy. Under the leadership of Knesset member Einat Wilf, this idea now has the backing of the prime minister’s office, the Ministry of Defense, and the Ministry of Foreign Affairs. In Washington, a coalition is still forming. Rep. Howard Berman (D- CA), the ranking member of the House Foreign Affairs Committee, broadly backs this idea but has yet to introduce language on the House side. However, bipartisanship may not be enough: The State Department, which pledged an additional $10 million in UNRWA in March, is expected to put up a fight. The legislation would undoubtedly anger some of Washington’s Arab allies, and Foggy Bottom tries to avoid that at all costs. But such grumblings will likely pale in comparison to the expected outcry in the West Bank, Gaza, and the Palestinian refugee camps in neighboring Arab countries. 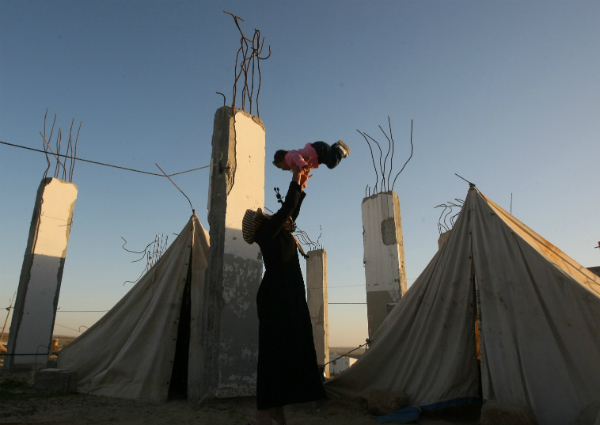 The refugee narrative is a sacred one in Palestinian political culture. Palestinian leaders will not simply table it because Congress passes new legislation. Rather, it’s a fair bet they will mobilize. When UNRWA merely mulled a name change in July 2011, Palestinians organized protests and sit-ins. Proposing real changes to UNRWA could even prompt violence. In short, the Kirk legislation would strip Palestinian the descendants of their political symbolism. It would be a landmark for this generations-old conflict, but whether it paves the way for peace or conflict remains to be seen. There are few more potent symbols of the Palestinian cause. Don’t expect Palestinians to give it up easily. Well … if you were an Arab, wouldn’t you declare yourself a palestinian to get all those UN goodies? And if you really hit the jackpot you get to live in Israel, so much better than the Arab-governed hell-hole you curently inhabit. Nearly one million Palestinians were forced to flee Palestine by Israeli forces as Israel was created. How come they were not allowed to come back once the war ended? This must be the only case in the history of the world where civilians are forbidden to go back home. the Germans of Mazuria in Poland and the Sudeten in the Czech Rep.
Wrong. The Jews from Lebanon: some 850,000 of them that fled to save their lives. They lost everything. And today, we have the Christians everywhere in ancient Christian but now conquered islamic lands. In March alone, close to 100,000 Christians fled Egypt to save their lives. They lost everything also. BENYAMIN: What a lie you are propagating. Haven’t you read the history books? Or are you just swallowing everything you hear without checking the facts first? The Arabs living in Israel fled because their arab neighbours promised them they could return in two weeks after all the Jews had been killed. Arab hatred for all Jews is so intense (qur’an) that they willingly give up their children as suicide bombers. WAKE UP! 900,000 Palestinians fled their homes in 1948 because they were chased by Israeli forces, or terrorized by the massacres committed by terrorist groups Irgun and Lehi, most notably in the village of Deir Yassin. You do not live the land where your family has lived for centuries unless you fear violent death. Israel is one of the only countries in the world which denied refugees the right to return to their home after the fighting ended, in violation fo refugee law. Indeed. One of … erm … most countries in human history. This must be the only case in the history of the world where civilians are forbidden to go back home. Given the Arab/Palestinian propensity for big talk mixed with lies and exaggeration, and their default position of playing the victim at every opportunity even as they are busily causing murder and mayhem, it’s not surprising that they should try to fool the rest of the world. The sickening aspect is that they should succeed. Times are hard the world over. Even viable economies are in trouble. Why then should they continue to subsidise corrupt regimes like those of the PA or Hamas who have absolutely no intention of bettering the lot of their people and instead incite them into hatred? Of course UNRWA’s remit is to perpetuate the problem as it carefully turns a blind eye to the terror its charity cases support or engage in. UNRWA provides jobs for the boys and is the world’s biggest gravytrain, colluding with and perpetuating Palestinian “victimhood”. It almost beggars belief that the West still subsidises it. Pull the plug. Force Palestinians in the luxury clubs, bars and hotels in Gaza to choose between working for the money they get (and working for peace) and subsiding their poorer brethren and sisters rather than leaving the UNRWA and the West to do that. I hope this gets through and that the EU follows suit. Kirk is marginalized in Congress, his influence is close to nill anyway. Can you imagine what is going to happen in the Arab countries that kept these “refugees” in “camps” all these years in order to use them as a distraction for the populations as a cause to use against Israel without UNRWA feeding, clothing, and housing them? Suddenly they will have the millions of “refugees” to deal with, who have no recognized claim to Israel or the RoR. And if Israel agrees to take in the 30,000 old people who really are refugees, its game over for the RoR. Its will be fascinating if this happens. I don not believe that the Arab petro-states will do much to replace lost US funding of UNRWA – they really couldn’t give a damn about the “Palestinian refugees” except as a source of cheap, stateless labor. The Palestinian refugees will never relinquish their right to return. You’re being extremely naive. I’m actually kind of impressed by your two posts put together: one of them lies about facts (that the Palestinians only fled due to “Israeli forces”, no other reason, no other factors, nothing else to see here…do you think anyone reading this is stupid enough to believe that when the documented record doesn’t back it up?) and the other falls back on emotion (that the Palestinians will never relinquish the right of return). So I’m going to raise you both a fact–the Palestinian refugee claims have slim international law backing compared to the extensive laws and rulings related to descendents and territories that show the people who were never residing in Palestine after 1948 have no rights whatsoever to receive citizenship in any ME state (that includes Jordan and a future Palestinian state, by the way) and an emotion–if the right of return is a zero-sum anchor of this conflict, then it’ll either last forever or end with the most bloody all-out war in the region’s history. At least in that case you’ll be able to rest easy, since it’s clear which side you’d like to see annihiliated. Not so sure about that Ben. I can obtain a Czech passport though I was never born there. In fact, I can even obtain a Polish passport though my grand parents left it in 1935. My uncle got an aussie passport as a result of being born in a Cyprus detention camp in 1947, even though he grew up in Israel and only moved much later as an adult. I’d like to remind you, and Benyamin for that matter, of the Shiites which welcomed Israeli forces 30 years ago to date when they entered their villages in Lebanon. They threw rice and flowers on our tanks and convoys thanking us for freeing them for the terrorising Palestinians. Sadly Israel chose to ally with the Christians and brought about the rise of Hizbullah assisted by Iran. We should have left Iran to its own fate in 1980 Iran Iraq war. The Arabs are in total panic over this. Abbas and the other head thugs of these so-called “palestinian” Arabs have no real intention or motivation for creating, developing or maintaining a state. They are welfare queens who make a fortune in easy handouts from the EU, UN and USA. Why should they exert any energy to become independent and lose all this easy cash? Besides the fact the Pali’s are unique in that the UN changed the definition of refugee for them and them alone; eg no pakistanis or Hindu’s descendants from independence are considered refugees, no Jewish descendants, Greeks from Turkey (I’d say armenians but the Turks murdered most), etc a simple question demonstrates the UN is only using them as pawns against Israel and a question I asked a UN official based in Gaza who could not answer is, “How can there be people classified as refugees in Gaza and Area A and B (under Hamas and PA control respectively) if they are living in Palestine?” In otherwords in any other conflict they could only be terms “internally displaced” and the same goes for Jordan which as part of Palestine before 1921. Internally displaced for generations within their own country hmmm that makes sense right? Also the Arabs only have themselves to blame for rejecting the UN decision and invading Israel. Let’s reframe this, why is it that Israel is the only part of Mandate Palestine a Palestinian cannot be a refugee in? Surely the answer should logically be that an Arab cant be a refugee in one of the 2 states create for Arabs from Palestine? Therefore the Jewish refugees are settled only by Israel but the Arabs get ultimately all 3 states created from Palestine according to UN logic. They get Jordan and Palestine (where no Jew may be a citizenin either) and then Israel is flooded with 10 million Arabs to become the 3rd Arab state. Just solution? So by the same logic India should be allowed to settle Pakistan with 250 million Hindus and have two Hindu States. This is excellent news. The Palestinians and UNWRA have been conning the world for decades with their inflated refugee numbers. In addition UNWRA have caused great damage to Israel’s image with false claims of humanitarian crises in Gaza (which strangely never seem to materialize.) It would be great to see them chopped off at the knees. Brilliant article by Jonathan Schanzer; brilliant thinking by Senator Mark Kirk. Duvidl is already splitting his sides with laughter at the apoplexy of panic this proposed change from refugee status is causing, not only in Gaza, Judea and Samaria, but also among the Guardian girlie scribblers staying at five-star Israeli hotels and at much less salubrious Guardian HQ in Farringdon Road. Am I wrong or is there stunned silence from the Guardian on this issue? If the Senate was proposing to recognize 5 million or so stateless Arabs kept locked up in Arab countries round the ME as “Palestinian refugees” (let alone recognizing as “refugees” those who have been living comfortably as citizens of the USA, Latin American and European countries for decades who still like to play the victimhood card) Chris McGreal, Sherwood, Greenwood, and all the other Guardian hacks would have a dozen articles up on the web site by now. The G never comments on the refugees – they are forgotten by the outside world. The US does recognise children and grandchildren as refugees in cases where no second or third country has granted citizenship – I suspect it will not change its stance on the Palestinians. Of the 5 million stated some are internally displaced in WB and Gaza – but obviously do not hold citizenship in the fully legal sense as Palestine as a country is not fully recognized as a country. Some in Jordan hold citizenship – some are having it revoked – those in Lebanon lack both citizenship and most basic human rights. Those displaced people in Syria who are included in the count – who knows their fate ? Constantly inssisting that the refugees solution is to be decided between Israel and Palestine is a double edged sword – this has let other nations off the hook ; it has failed to pressurise for solutions from those countries hosting refugees and those other countries who might have offered asylum and citizenship. Constantly calling it a ‘final status’ issue has allowed the world to forget the refugees. as the numbers rise the situation becomes worse, a solution needs to be found. Uncertainty needs to be removed from lives and futures planned. Simply depriving people of support – financially and morally – would be a disaster – a likely trigger for a violent reaction. A more constructive and inclusive solution is needed. I doubt if the combined territories of Israel. WB and Gaza have the carrying capacity to support another 5 million – and rising. The proposal doesn’t cut off support. Hello – the main problem – or one of the many – is that UNWRA does not have a brief to provide/ create jobs for the refugees . In Lebanon for instance refugees are debarred from certain jobs and denied full civil rights. Under the International Refugees code and practice refugees have the right to protection. The UNHCR has made it a policy foundation that the settlement of the conflict which sparked the refugee crisis is the main aim – thus preparing the way for return. From this springs the ‘final settlement’ response which effectively ignores the refugees in the present time. Long standing refugee problems in Africa foir instance were solved by UNHCR – quotas were agreed with different countries and offers of resettlement were made. Some refugees returned to their own countries – not all. It is accepted that refugees must be given a choice in where they go – the head of household is interviewed – if s/he is offered resettlement the family are then included. The Palestinians – along with some other people in long standing camps – have now , almost by default , been granted refugee status for the third and even fourth generation. For as long as they have neither citizenship nor protection this will continue. We need to remember that the ‘rules’ were established in post WW2 situation – people in camps across Europe for instance were resettled within a matter of a few years. My view is that until there is a genuine international effort to sort the refugee problem – which means re-examining certain assumptions and practices – there will be no solution. Why for instance, is somebody born in Lebanon 40 years ago still regarded as Palestinian ? The simple answer is because he has no other identity which affords him amd his family protection. We need a three way solution – limited RoR, resettlement in third countries and the granting of citizenship and full civil rights in those countries currently hosting refugees. This would not only solve the very human problems the contiuing crisis generates but would also allow for the more constructive allocation and use of funds. We would no longer simply be supporting an unsustainable and growing problem. We need to support the refugees outside the context of the continuing dispute . UNWRA = United Nations WORKS Relief Agency. They do provide jobs. It’s Lebanese law that bars the refugees from jobs and professions. You should read a bit more about UNWRA’s history. Leni, do you really believe that even if UNWRA could do that, these people would actually work for less money than they are receiving in pity money? What, apart from the handouts and their determination to wage war rather than engage in state building, is there to prevent them from creating an economy and jobs for themselves using the UNRWA money as capital? And blame the Jews for it. (I’ve noted Jeff’s reply below). Leni, the Arab countries need to absorb the Pals, as the Israelis did of an even greater number of Jewish refugees from Arab lands. The Palestinian Arabs share the same language, religion and culture as the 22 Arab countries. The 22 Arab countries, uninterested in aiding in Palestinian brothers, preferred to use them as a political weapon to wield against Israel, and the U.N. supported this heartless human manipulation. In the mid-1970’s Israel attempted to give the Palestinian Arab refugees in Gaza new and better housing. The U.N. General Assembly, at the urging of the Arab states, passed Resolution 32/90 condemning Israel for trying to relocate these refugees and demanded they be returned “to the camps in which they were removed.” And yet, a senior U.N. official came to Gaza in January 1988 accompanied by 10 TV crews on a fact-finding visit and laid the entire blame for the situation at Israel’s feet. As if the U.N.’s own complicity in the matter didn’t exist! a) What business does CiFWatch have commenting on US immigration policy? b) What does this post have to do with anti-Semitism at the Guardian? c) “The refugee narrative is a sacred one in Palestinian political culture.” That disparaging comment is pretty heartless – especially within the context of this site and the reborn Israel. a) The beauties of the internet. Anyone can comment on anything they damn well like. b) Where does it say that CifWatch ONLY EVER comments on anti-Semitism at the Guardian? Should Adam not have posted the “Happy Shavuot” piece, or the Friday postcards? These are nothing to do with anti-Semitism at the Guardian either. c) It may be a disparaging comment, but for all the reasons given by other posters on this and other sites on this issue, it is nonetheless true. As AKUS said, it is hard to understand how a wealthy US citizen can regard themselves as a “refugee”! a) This site’s mission statement is about anti-Semitism at the Guardian. So I repeat: what does this have to with US immigration policy? And you quote from AKUS aka “I am directly descended from Aaron”?? Unbelievable. Again you disappoint me.